A thief who battered a night-watchman to death with a hammer and crowbar has been jailed for life. Callum Allen, 31, of Draycott, Derbyshire, lashed out at the worker more than 10 times at the Thorntons toffeee factory, in Belper. He had broken in to plunder the site's gaming machines. 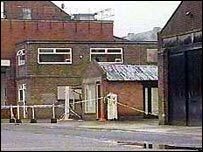 Allen, who had denied murder, said he had broken into the factory on 12 August, 2001, to take revenge on his former employers and a former colleague who had taunted him for being gay. The court heard Allen, who had worked as a security guard at the factory between 1997 and 2000, went to the site armed with a claw hammer and a crowbar. When confronted, he bludgeoned father-of-three Jasvinder Singh Bohgan to death. Mr Bohgan, 42, was found in a pool of blood by two workers arriving for an early shift. Jailing Allen, Mr Justice Gage said: "Having just broken into the Thorntons factory in Belper you came across the sole security guard and you attacked him with a hammer and a crowbar. "Having disabled him you dragged him into a carport, next to his car, and savagely beat him round the head with a hammer. "This was a brutal and truly shocking murder. You are a dangerous and devious man." "By your actions you have taken the life of an entirely innocent man who was doing nothing more than carrying out his duties." Following the verdict, Detective Superintendent Jack Russell, of Derbyshire Police, said: "The family are pleased that Allen has been found guilty and happy with the fact that he has been given a life sentence. "They can never forget Jas, and this will be of little comfort, but they now feel that they can put the incident behind them and try to move on with their lives." Allen was handed a life sentence for murder and two concurrent three-year sentences for burglaries at the factory.